This book shows over 200 posters dating from the railways' heyday prior to nationalization. The book explains the history of the companies and examines their attitude to poster advertising. The National Railway Museum in York has a large and varied collection of railway art and artefacts; this books shows over 200 of the best posters dating from the railways' heyday prior to nationalization. In this period, renowned poster artists of the calibre of Edward McKnight Kauffer, Tom Purvis and Cassandre were commissioned by the railway groups to promote not only their lines but also the most beautiful and appealing cities and towns in their areas for tourists to visit. The railway companies virtually invented the "package tour", and promoted it intensively not only in the UK but also in the USA. The introduction explains the history of the companies during the period covered, and examines their attitudes to poster advertising. The book is then divided into four sections, one for each of the railway groups: the resulting selection makes an analysis of poster art in the UK in its "golden age" of the Twenties and Thirties. Extended captions explain the context of the works, and information about the artists is provided. 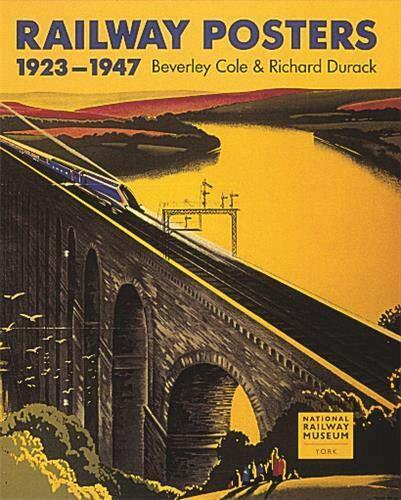 The authors are on the curatorial staff of the National Railway Museum, York.